Citrus is a great degreaser and vinegar is a powerful cleaning agent, breaking down mold, grease, limestone and bacteria. This is why I combined them to make this great eco-friendly cleaner! It is 100% natural, inexpensive, it works really great and you can use the rind of citrus fruits, which you would have thrown away . Squeeze Oranges and use the juice otherwise. (Lots of good vitamin C for you!! :o)) Put the orange rind into a 2 l jar. Pour vinegar over the orange rind and close jar. Let sit for 2 weeks. 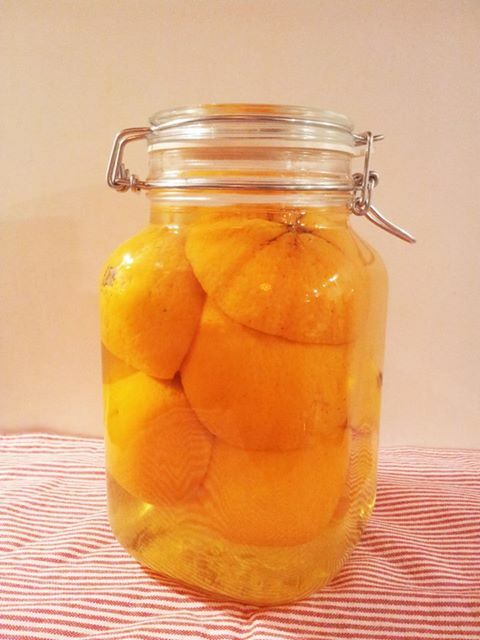 Remove orange rind from the jar and strain orange vinegar. Use orange vinegar 1:1 diluted with water to clean the kitchen, bathroom, floors and more! The oranges completely neutralize the vinegar scent. It smells good!